The Sacred Heart is your clear connection to your Source. It is your repository for your Creator Consciousness, though truly this is in every space/non-space of your physical body and your world. 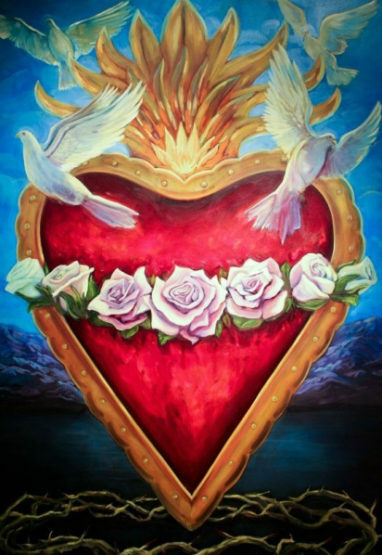 The sacred heart, like a well-spring source, houses your creation composition, a substance that is smaller than any of your instruments have found, and yet it is the substance that builds all matter. It adheres love to light, it ignites creativity and enlivens it into form. This substance is etheric, never being seen in form, for it doesn’t clump together into form, it bonds creative intent (creation) to thought, emotion and then to form. It is the etheric, the spirit—enlivened into form. It is intent realized into Life. The sacred heart is not as much of an interacter as a normal chakra, it is a mechanism that flows always, and enhances upon resonant trigger. When the intent matches the frequency that will access the well-spring of Source flow, the high-heart brims forth with Love of a non-human sort. This ethereal Love is not the Love you feel for the people that please you when you interact with them or that have a familial bond to you. It is the love that you feel for All Life that pushes your vision past the skin, the personality or the deed and shows you the Love potential within every human. It is the Love that shows you that All Life is brimming with Love potential that the world is receiving and flowing back. With the eyes of the Sacred Heart you see the Soul that chose to be a warrior for Love. This entry was posted in Uncategorized and tagged etheric force of sacred heart bonds creation (thought) to emotion to form, Jayme Price, love, Sacred Heart is your connection to Source, time of Love = time of sacred heart, warrior for Love. Bookmark the permalink.